Lorraine Wilkie, president of the Flaxcombe branch of the Royal Canadian Legion, and Dave Chudyk, past president of the branch, gather for a photo opportunity by a commemorative cake on Oct. 20 at the branch’s 90th anniversary celebration at the Flaxcombe Community Hall. The event included a performance of Tommy Goes to War by actor Vincent Murphy of Regina. Members of the Flaxcome Legion have gathered with other supporters to mark the branch’s 90th anniversary, and to raise money for an important cenotaph project. 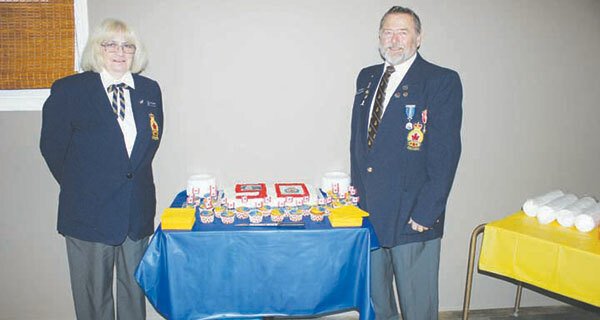 The Royal Canadian Legion branch held its celebration on Oct. 20 at the Flaxcombe Community Hall. The 90th anniversary celebration included a supper, a silent auction, a short program and a one-person theatrical performance of Tommy Goes to War presented by Vincent Murphy. Lorraine Wilke, the branch’s president, addressed the 65 people on hand for the anniversary celebration. She spoke about her family’s long history of involvement in the Legion and she mentioned the pride she had as a young student to see her father Eric Coutts at school Remembrance Day functions in his role as the branch’s Sergeant at Arms. She said the branch’s 90th anniversary was on April 26, but members wanted to wait until the fall to hold a celebration in hopes of people being finished with harvest. Although it did not work out as planned due to an ongoing harvest, the event went ahead.